The Apple IIe, the third in the Apple II series, got its e by being enhanced. That is, by coming with a minimum of 64k of RAM, featuring a full ASCII character set and keyboard, and more expansion options than ever. Interestingly, this eBay auction for an Apple IIe will get you a machine that's really extended, but is also tested and fully working. 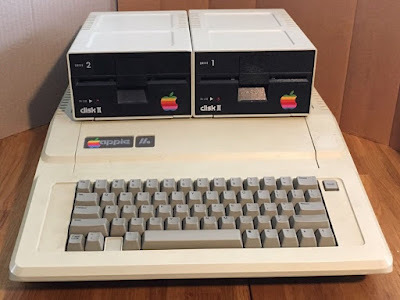 The computer comes with two disk-drives, the Apple IIe Extended 80-Column RGB Card, the Super Serial Card, the Apple Computer Mouse Interface Card, and the Disk ][ Interface Card. It is also accompanied by two manuals.